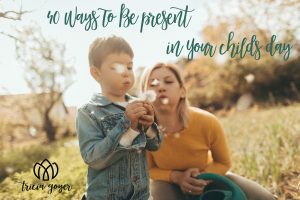 In the midst of a busy day it’s easy for mamas to think of our children as “tasks” rather than as “hearts” we need to connect with. I sometimes struggle with putting my kids before my to-do list. After all, I can mark things off my to-do list as “done.” With kids, they are never done. It hurts my heart to realize what my kids see and experience on some days: a busy, distracted mom who orders their lives instead of really seeing them. “If young children live in the present and adults spend most of their time in the past or in the future, we have abandoned our children to some degree,” says Becky Bailey, PH.D., author of I Love Your Rituals. Do you expect them to be able to entertain themselves so you can get your work done? Do you use the television or video games to keep your kids occupied more than you should so you can focus on your work? I’ve been guilty of both. Yet, I also know children can only entertain themselves for so long. Children will do what it takes to get our attention. Won’t they? We must give our children attention—real, focused, positive attention. I’ve found when I spend even ten or fifteen minutes with my children at regular intervals during the day, they are happy to entertain themselves or play positively with their siblings at other times. When our child’s love tank/attention tank is full, then he or she has fuel to feed other positive relationships. Each moment in our day we have the choice to be present. Our children will not only benefit from it, but we will reap the rewards. Sing “This Little Piggie Went to Market” as you put on your child’s socks. Make eye contact when your child asks you a question. Use different voices when reading a bedtime story. Get on the floor and invite your child to join you. Create a gratitude journal with your kids and add to it through the day. Put down your smartphone. Set it aside and pick it up and check it once an hour. Write things you appreciate about your kids on post-it notes and repeat these things often. Ignore the dishes, the laundry, the vacuuming for the first hour of the day and start the day off with your child. Teach your child a finger play you knew as a child. Reflect on what your child is doing at that moment. “You are standing on one leg. You are jumping up and down.” Don’t feel you have to praise for no reason … kids just enjoy the focused attention. Teach your child a simple chore. Slow down. Take twice as long as you plan on doing something, and do it with your child. Tell your child about an experience you had when you were his/her age. Soak in your child’s stories. Ask for more details. Ask your child what he/she would like to do for ten minutes. Set a timer and have fun. Go into the yard and see what type of creatures you can find. Tell your child than you are so thankful he/she is part of your family. In your mind trade places. How does your child see you in that moment? How do you want your child to see you? Bring out your photo album and share a special memory. Host a family meeting and highlight things your family can look forward to and things your family is doing right. Catch your child doing something right. Ask your child to help you with whatever you’re working on. Go on a lunch date. See how high you can count as a team. Tell your child about the first week after they were born. Tell your child the meaning of her name. Memorize a Bible verse together. Forgive yourself. Don’t let your mind wander to the past and all the ways you’ve messed up as a parent. Give that to God. If you find yourself thinking/worrying about the future file that away for later when your kids are in bed. Better yet, give that to God, too! Now . . . what can you add to this list? I’d love to know! Read the original post over on The Better Mom! Also, I’d love to hear how YOU are present! Such a fun and sweet list, Tricia! I don’t have kids yet, but I’m always on the lookout for good ideas to be a great mommy once I do have kids. You’re very smart at doing that, Andrea! Those are great ideas for little ones. However, I have ages 8-17 so I don’t think many would apply to them. I find most blog posts to be about elementary ages and below. Unfortunately, there’s not a lot out there for middle school and above. Stacey, that’s a good point. Maybe I should write ones for moms of older kids.